The ideal everyday item of lingerie, the whole DKNY Urban range is beautiful and is everything modern fashion should be about. It is simple, versatile and timeless, the hallmarks of 21st Century fashion. 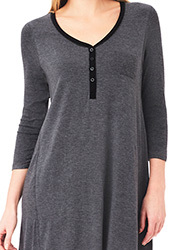 This sleepshirt is no different, with a grey and black colour scheme and a flattering and figure highlighting cut, it is ideal for actual sleepwear or for relaxing in whilst still looing stylish.